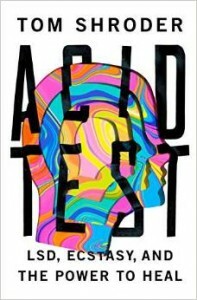 Acid Test: LSD, Ecstasy, and the Power to Heal by Tom Shroder is the book that a lot of us in the psychedelic research community have been waiting for. To understand why, consider the following excerpt in which Shroder retells the famous story of Albert Hoffman’s discovery of LSD. Shroder enlivens this familiar story with intriguing details and remarkably clear prose. He turns a journalist’s critical eye on a notoriously fuzzy topic. There’s no metaphysical speculation in Acid Test, just moving stories of people whose lives were changed by nature’s most powerful and mysterious psychoactive chemicals. Nicholas Blackston is a former US Marine who fought in Iraq. His horrific experiences in combat left him scarred by post-traumatic stress disorder. Michael Mithoefer is a psychiatrist who discovered the transformative power of LSD as a college student. He conducts research studies using the psychedelic/stimulant MDMA (“Ecstasy”). Rick Doblin is the founder of MAPS, the Multidisciplinary Association for Psychedelic Studies. He has been a leading advocate of psychedelic research for decades. Shroder makes it clear that psychedelics were a well-established and promising tool for research and therapy in the 1950s and 60s. We can’t calculate the cost of the War on Drugs to human life or scientific progress. We can, however, be grateful that organizations like MAPS and the Heffter Research Institute kept the flame burning during dark times. The stories of Shroder’s three protagonists come together near the end of the book when Nicholas Blackston enrolls in a MAPS-sponsored study on the use of MDMA for treating PTSD. Ecstasy helped Blackston escape from the prison of war trauma and discover new freedom. Today, he’s an eloquent advocate for psychedelic therapy and living proof of its success. If you’re new to psychedelic studies, this book is an excellent starting point. Shroder, the editor of the Washington Post magazine, knows how to present a big and complicated story in human terms. He has a gift for wrapping hard issues in a compelling narrative. The one thing I would have done differently is to shift the balance of the book’s content to include more on psychedelics and less biographical detail. That’s a quibble, however. I hope that Tom Shroder continues to cover psychedelic research. We need him.